Scoliosis is a buckling of the spine in all directions but often appears as though it bends to the side. It usually develops in childhood and until the person reaches skeletal maturity at the age of about 20 it can progress. Between the ages of approximately 20-50 the scoliosis is usually stable. After 50 the scoliosis can begin to worsen again especially if the patient develops conditions such as osteoporosis. It is important therefore to ensure that a scoliosis is detected in early childhood and is properly assessed at regular intervals by an orthopaedic physician to ensure that it causes as few issues as possible both in the present and in later life. As well as seeing the orthopaedic doctor is also beneficial to see the chiropractor who can help maintain the flexibility and strength of the affected areas. Scoliosis is a relatively complex topic as the true nature of their aetiology (cause) isn’t fully understood. Genetic inheritance is believed to occur in 25-35% of cases but what about the rest? The majority of scoliosis is described as idiopathic meaning of unknown cause. There are many theories that try and explain its cause such as incorrect or misinterpreted information being passed down the spinal cord; this neurological theory may explain why those with scoliosis often have balance issues. A more mechanical model theorises that those with more slender vertebrae have less ability to accommodate increased loading of the spine leading to the buckling effect that we see. Interestingly, idiopathic scoliosis is rarely painful until later life. The prime consideration in the management of the scoliotic patient is to prevent progression and reverse the deformity. For the patient it is the cosmetic affects which are most concerning however, for the physician it is the possible but rare effects the deformity can have on the cardiopulmonary (heart and lung) function. To determine whether there may be progression of the deformity we first have to understand whether the scoliosis is structural or functional. A structural scoliosis occurs were there has been bone remodeling and will usually lead to some form of more permanent scoliosis. A functional scoliosis is usually compensatory for a bio-mechanical issue such as muscle spasm and is often painful. It can usually be treated successfully with chiropractic care. There are several treatment options available to the scoliotic patient including bracing, exercise, chiropractic adjustments and surgery; no one technique should be used in isolation. Bracing is a slightly contentious topic and should always be carried out under the guidance of an experienced orthopaedic doctor. In the authors opinion if bracing is utilised it should also be accompanied by rehabilitation exercises and gentle spinal adjustments to ensure that the strength and flexibility of the spine isn’t lost during the period that the patient is being braced. Surgical options are only used in a small number of cases but it is outside the scope of a chiropractor’s knowledge to comment in the many varied procedures that can be used. Many of us lead a sedentary lifestyles due to commuting, sitting at the desk all day and watching a little too much TV. So what is poor posture and why is it a problem? Sometimes a picture paints a thousand words so, which would you prefer to be? The issue with poor posture is that it places extra loads/forces into areas of the body that are not designed to take the pressure. This can become particularly pronounced if that posture is sustained for long periods of time, such as sitting at your desk, or if an increased load is being carried. Particular care must be taken with manual handling and weight lifting, can you imagine what would happen if you were to pick a heavy item off the floor with anything other than good technique. 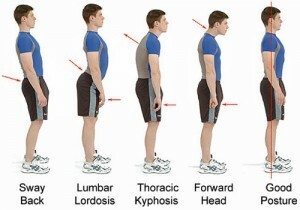 If you are concerned that you suffer with poor posture why not make an appointment to have an examination at the clinic? Chiropractors are highly trained at detecting and dealing with postural issues and at Aligned For Life Chiropractic in Leatherhead we have treated many people with similar postural issues as you. In most cases a few simple exercises, gentle adjustments and some advice are all it takes to get you looking aligned for life. The other issue with poor posture is the overall effect it has on the way in which people perceive you. If you go to the news section of the website you can see a great TED talk that explains the importance of posture in your body language.